Manuia Beach Resort fronts onto sparkling blue water and a stunning white sandy beach. This adults only Cook Islands accommodation is surrounded by tropical gardens and is the perfect place for couples to base their next holiday in Rarotonga. Spend some time relaxing by the infinity swimming pool or play some golf which is just up the road from Manuia Beach Resort. This amazing combo deal allows you to experience the best of the Cook Islands with 3 nights at Manuia Beach Resort and Tamanu Beach Resort! 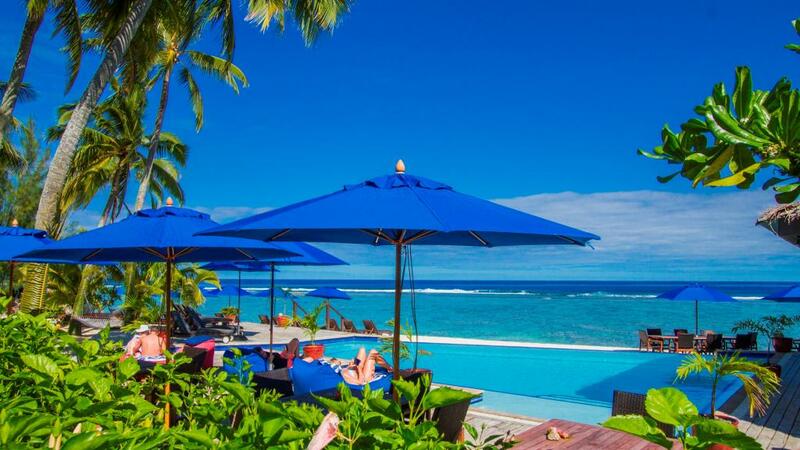 Manuia Beach Resort is located on the island of Rarotonga and fronts onto sparkling blue water and a stunning white sandy beach. Located on the west coast of Aitutaki, Tamanu Beach offers stunning views of the lagoon and an intimate and relaxed island setting! Both properties are adults only, providing guests with a romantic Cook Islands escape to remember!